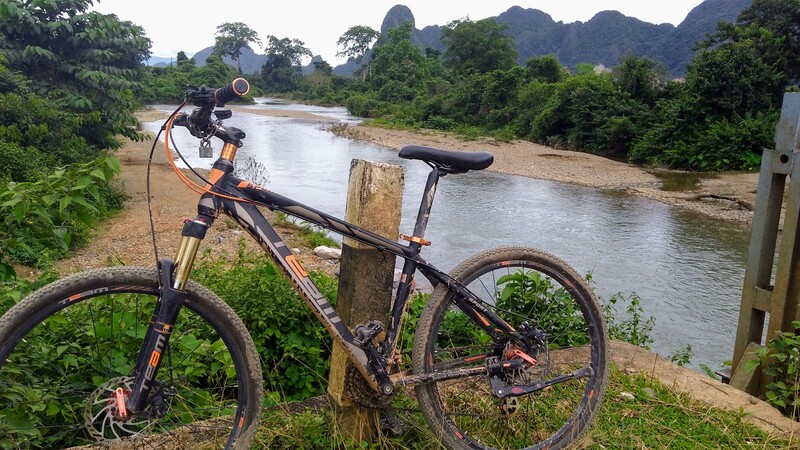 After the failed walk to Pha Phoak, I made it my quest to rent a decent mountain bike so I could explore Vang Vieng’s backcountry at my own pace and away from the package crowds. I found it surprising that all the bicycle rental outlets agreed on a price of 30 000 kip for mountain bike day rentals – the only real variation being the quality and, especially, the state of the bikes themselves. Was this a question of collusion on the supply side? Or the influence of Communism, perhaps? I walked far too long in search of a better deal, only to find a mountain bike in marginally better shape – not worth the extra sweating in any case. But finally I felt free as I paid the revolutionary tax on the wooden bridge and began pedaling on the paved road toward Blue Lagoon 1, still uncertain as to where exactly I’d wound up. I saw a tall blonde European couple (Dutch?) with equally tall but slender teenage children emerge on their mountain bikes from a dirt road I’d barely noticed. I said hi and continued on my way, but then thought better and turned round. “Where does that go to?”, I asked the dad. “A cave. Tham Khan Cave” he said, pointing at the sign. Sounded good. I thanked him and started cycling on the dirt road, happy to leave the asphalt behind. Shortly after I was asked to pay admission to the sight by a couple of sheepish watchers who would be watching my bike for a while – that’s whenever they were not texting away on their cell phone. Meanwhile, a short and skinny middle-aged man in flip flops beckoned me to follow him. “This way to cave”, he said. And so we started the walk on a trail bordering the mountain stream, until the stream became the trail and my guide told me to take off my running shoes. Noticing that barefoot I had trouble keeping up with his pace, he offered me his flip flops – but he still walked much faster than me on the stream. The hike seemed to be never-ending, but the scenery was increasingly tranquil and beautiful. At last we got to a discrete opening in the craggy face on the mountain. My guide ordered me to put my running shoes back on, and gave me a flashlight so that I could watch my step – and the huge spiders hopping off the boulders as I stepped on the rock. Now that was a relief. Now I don’t love walking in caves, but I did enjoy the eery feeling of having my life depend on the will of a man who I could barely communicate with as he guided me through the intricate maze of galleries and tunnels. Supposing he were to abandon me in one of the caves? Instead, he guided me to a small Buddha shrine, which I saluted respectfully with a high wai. Once outside the cave, my guide completed his mission by offering me fresh rambutan as he asked for a tip. Sure, I said, handing him a couple of thousand kip below the asking price. Back on the main road, I found a roadside cafe and decided to take a break. The larb moo was bland, but the views were great and the waiter friendly enough. Looked alright – tasted bland! After my lunch, refreshed, I resumed by cycling. Common sense said turn back, but of course I pedaled the opposite direction, lured by the promise of a circuit loop involving waterfalls, viewpoints and a dip into blue lagoon 3, many kilometers away. Too many, I felt, as my body started aching after mile after mile negotiating puddles and potholes. I found Blue Lagoon 3 murky and overcrowded in comparison to beautiful Blue Lagoon 2 the day before. I paid admission and took a quick celebratory dip, which I hardly enjoyed. I kept thinking that my wet boxers would be a problem as they rubbed against the saddle of the bike on the way back. But they weren’t. Instead, the hour or so that led me back to familar Blue Lagoon 2 and Vang Vieng was delightful, as it gave me a glimpse of Lao country life, with its small town general stores, its family celebrations spilling on to the main road (still a dirt track) and, more than anything else, animals: chicken, ducks, pigs, cows, oxen, water buffalos and stray dogs. More than ever, the road is life, I thought. Even better: I finally found some genuine smiles in Laos. Offered by kids, of course, cramped in a pick up track which I enthusiastically raced. I failed to keep up with it, but got closer to the smiles and cheering kids. I panted, feeling my heart expand with joy. And so went a true B-Side day in Vang Vieng. Uneventful, not quite picturesque, but peppered with surprises all along the way. In want of a restaurant serving decent Lao food, I shared my stories with Ek over a few pints and hearty pub grub at Gary’s Irish Pub.